The concept was revealed in a new patent application published this week by the U.S. Patent and Trademark Office and discovered by AppleInsider. Entitled "Portable User Device with a Clip Having Electrical Thermals," it describes different ways that a device with a clip could be used to secure, charge and sync it. In particular, the application includes illustrations that show a device extremely similar in design to Apple's current iPod nano, which features a multi-touch display on the front and a clip on the back. Currently, the clip is used to make the device wearable for activities like exercise. But if Apple's new patent application becomes a reality, that clip could also include charging contacts. With a new charging base, users would simply clip the iPod nano, or any other clip-equipped device, onto it to recharge its battery or even transfer data. The filing notes that portable media devices usually rely on a plug-and-socket connection for charging and syncing. This is also the case with the current iPod nano, which features Apple's standard 30-pin dock connector. Apple said that clips on portable devices can be used to affix them to an article of clothing or an accessory, but aside from mechanical clamping, the clip does not provide any other function. 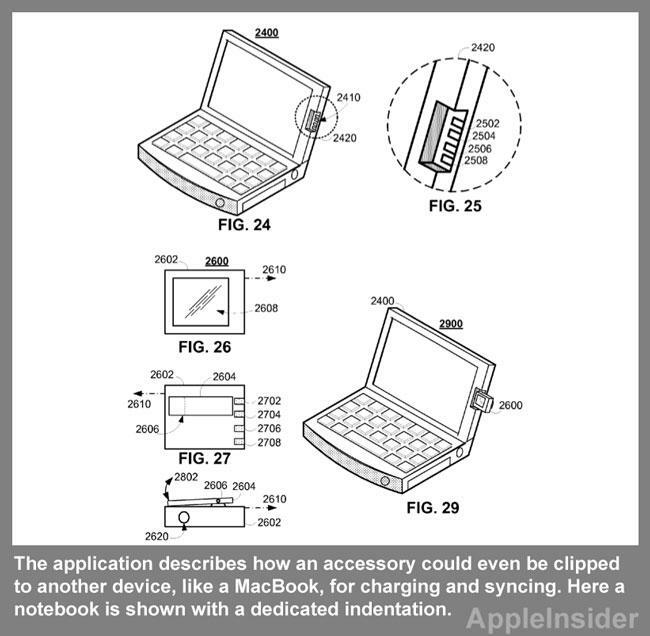 In Apple's concept, the clip would be "electrically coupled to the rechargeable battery." The clip would also provide a "clamping force which aids in maintaining contact between the receiving receptacle and the clip member." Apple's application even goes beyond the iPod nano itself, and describes how an accessory could even be clipped to another device, like a MacBook, for charging and syncing. In one illustration, a notebook computer features an indentation to the right of its display where an accessory could be clipped. In a more traditional example, Apple shows a regular iPod charging dock with an adapter that would allow the clip to be securely fastened and connected. 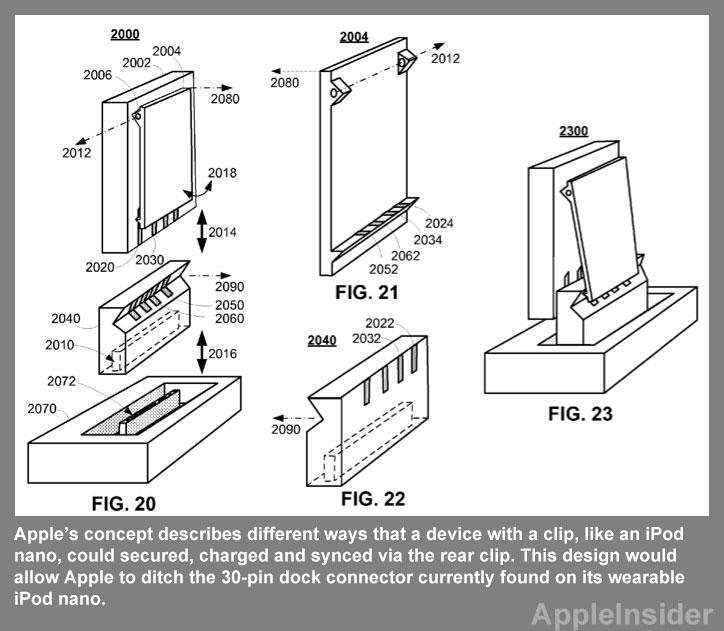 The illustrations accompanying the application suggest Apple could apply its concept on devices beyond the iPod nano. In one image, a phone with a rear clip featuring charging and syncing contacts is also shown. The proposed invention, made public this week by the USPTO, was first filed in January of 2011. It is credited to Jeffery T. Lee and Scott Krueger. The filing comes as a new rumor published this week suggested Apple is working on a new iPod nano that would ditch the current square design and rear clip for wearability. Instead, it claimed the device will feature a rectangular touchscreen and a dedicated home button, much like an iPhone or iPod touch. It was also said the device would have a dedicated built-in iTunes service for accessing content.